The 1980s were a peculiar time in the evolution of electronic instruments: the availability of microprocessors and new digital technologies meant that instrument designers were free to explore new means of sound creation outside the realm of analog circuit design. While many analog synthesizers remained available and popular, the potential of digital technologies promised lower production cost, lower weight, and expanded sonic potential for consumers. Countless new synthesis methods emerged: FM, Phase Distortion, resynthesis, and more. Without knowing where the industry was going, new designs and concepts came and went...some gaining traction, others disappearing into the unforgiving annals of history. This is one of my favorite periods of synth history: it is always remarkable to see what designers imagine when entirely new possibilities are presented. Sequential Circuits is one of the shining examples from this period: a company that embraced the best of old and new technology, bringing paradigm-changing products and completely new methods of sound production to the masses. 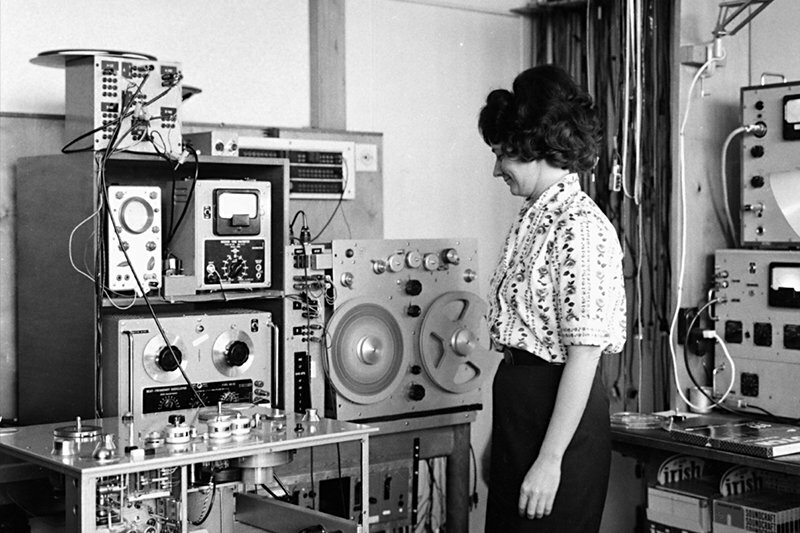 Like other companies, they sought to create sounds that could grow and evolve over time, breaking free from the limitations of analog technology: and they succeeded with the Prophet VS. The iconic Sequential Circuits Prophet-5. Dave Smith broke his way into the electronic musical instrument industry in 1974, with the establishment of the now widely-heralded Sequential Circuits. Sequential's first products were modest devices meant to enhance the potential of other companies' offerings. Working primarily with microprocessor-based designs, Dave Smith first created sequencers intended for use with the famous Minimoog Model D and ARP 2600 analog synthesizers. As his day-to-day work with microprocessors continued, he developed the concept of combining a more-or-less typical analog synth architecture with microprocessors to create an (at the time) unprecedented instrument: a programmable polyphonic synthesizer. 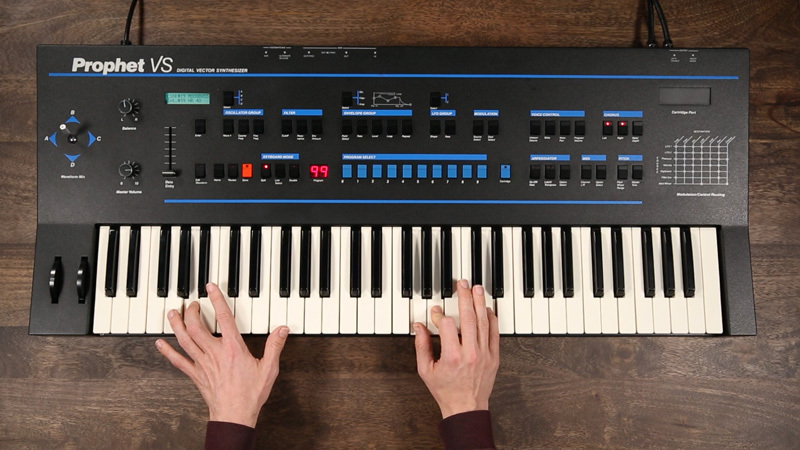 The Prophet-5 was debuted at the NAMM show in 1978, quickly taking hold of the synth industry: by leveraging a microprocessor-based design, it was able to offer preset memory for easy and instantaneous access to a wide variety of sounds, as well as the ability for users to program their own sounds. The Prophet-5 quickly established itself as a primary competitor to the Yamaha CS-80 and others, and Sequential secured its place in the annals of synth history. Sequential Circuits went on to produce a number of other amazing synthesizers from the Prophet-5's lineage: the Pro One, the Prophet 2000, Prophet 600, Prophet T8, and others. 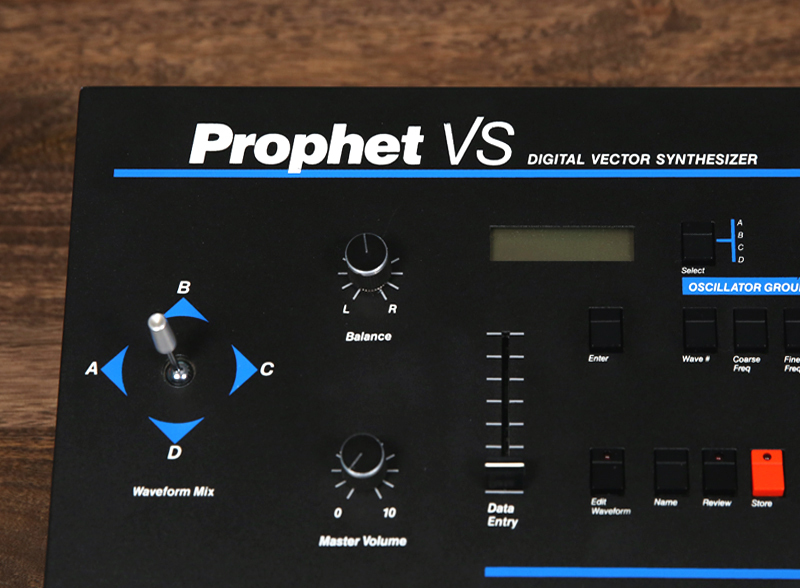 For a handful of reasons, the company dissolved in 1987—but not before the completion of perhaps the most peculiar Prophet...the Prophet VS, which introduced an entirely new synthesis concept to the world: Vector Synthesis. 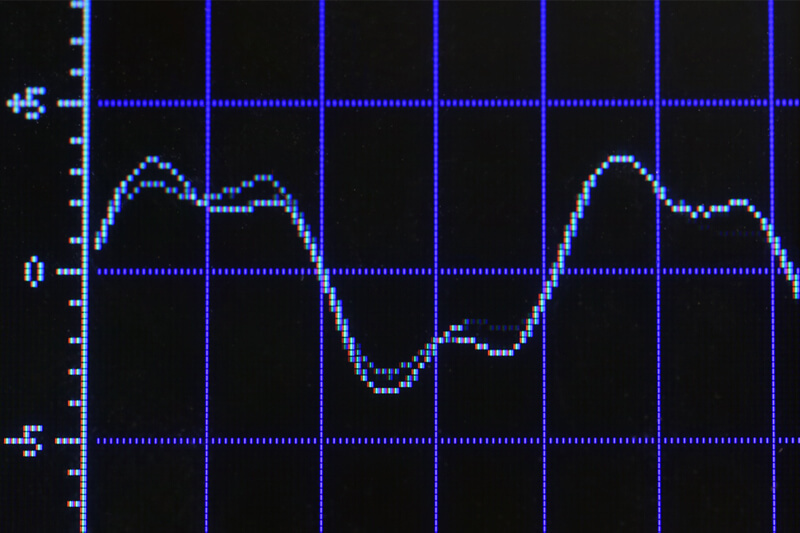 Before getting into Vector Synthesis, let's briefly detour through wavetable synthesis. In the late 1970s, Wolfgang Palm of PPG developed wavetable synthesis in order to bring easy access to a wide variety of timbres. Prior to Palm's innovations, most electronic instruments produced complex wave shapes through one of two methods: addition of several simple wave shapes (that is, using multiple oscillators mixed together to create more complex shapes), and direct manipulation of the wave shape through additional processing (as in the "timbre" circuits in Don Buchla's 208/Music Easel, 259, and other instruments). The advent of relatively inexpensive digital storage, though, offered the possibility of a different technique: one in which arbitrarily definable arrays of information could be used to generate sound, and could be organized into "tables" that offered easy access to tons of different waveforms within the turn of a knob. A waveshape array scanned with a linear ramp function (above); the same array scanned by a triangular function (below). 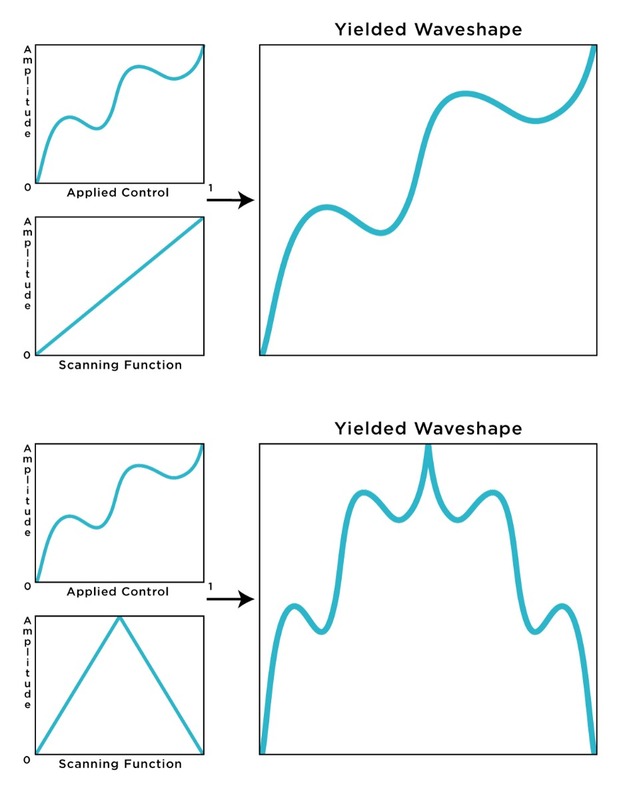 In its simplest form, wavetable synthesis involves a two-dimensional graph (which we'll call a wavetable array, where the X-axis relates to time and the Y-axis to signal amplitude. These arrays can theoretically have any number of internal X-axis positions, which I will refer to as indices—ideally, these individual indices have various amplitudes. By using a counter to select which index is currently active, the array can be "scanned" and converted into an audible signal. The counter is often in effect a ramp generator, a "saw" wave that scans the array and reports the current table value. In this case, the array itself is the same as the yielded waveshape; synthesizers with this functionality built in will often dispense of this more technical terminology in favor of referring to the array simply as a waveform. By extending the technique beyond this simple level, countless possibilities emerge—one could scan an array with variable-intensity functions to treat it like a nonlinear waveshaper—one could scan it with non-linear shapes, or variable shapes—one could rapidly switch between arrays for sudden changes in timbre—or one could interpolate between multiple different arrays scanned by the same function, in effect creating a continuous crossfade between different complex timbres. While Don Buchla's digital instruments (namely, the 360, Touché, 400, and 700) focused on digital tables scanned by variable-intensity sinusoidal functions, this technique was fairly uncommon. Many instruments instead provided the ability to modulate array selection and interpolate between multiple arrays: hence the term wavetable synthesis: a table of arrays that can be switched between to create dynamically-changing timbres impossible with simple subtractive methods alone. 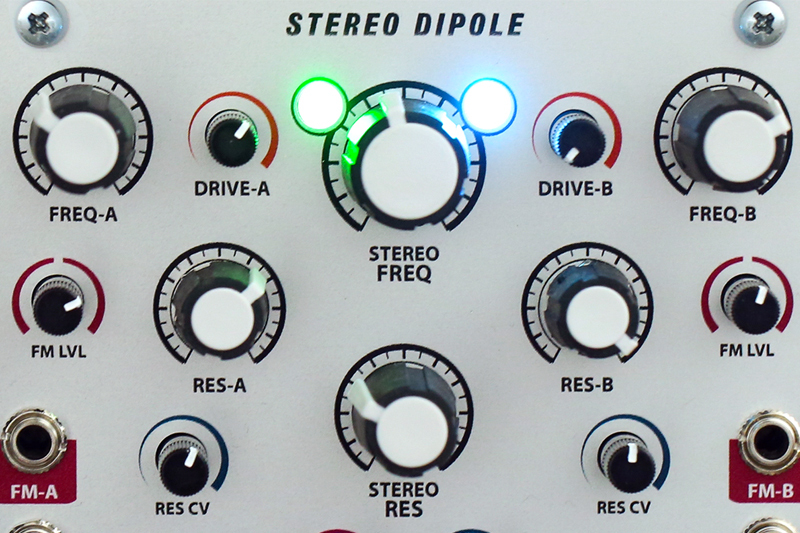 In effect, this makes it possible to access an enormous number of wave shapes within the turn of a knob. Wolfgang Palm's instruments were the first commercially-produced synthesizers that employed wavetable synthesis. The ever-popular PPG Wave was a polyphonic synthesizer that organized its potential waveshapes into thirty tables, each containing 64 distinct waveforms. Selection from shapes within a table could be executed via LFO, envelope, or even key pressure—and the effect changed dramatically depending on the currently active table. Some tables were intentionally designed so that switching sequentially between adjacent shapes would create more or less continuous changes in timbre, while other tables featured starkly contrasting waves, allowing the potential for jarring changes in timbre reminiscent of the abrupt modulations provided by a sample & hold. Navigating between different waveshapes became a primary consideration in instrument design, with many instruments' distinct character hinged on their particular implementation of wavetable-like designs. Many manufacturers found different solutions for how to exploit this array-based technique to create instruments with a distinct character. The Prophet VS is one such beast. The "diamond" vector space as presented on the Prophet VS panel. Chris Meyer, the conceptual creator of the Prophet VS, states that the "Eureka" moment that led to the Prophet VS emerged from a conversation about the PPG Wave—while drawing an explanation of the Wave's interpolation method, it occurred to him that waveshapes could be interpolated in two dimensions. That is to say—rather than fading constantly between two waves on opposite ends of a spectrum, it could be possible to have a diamond shape with different waves at each corner, and to traverse seamlessly between the four in order to create a wealth of timbral variety from only a handful of distinct shapes. 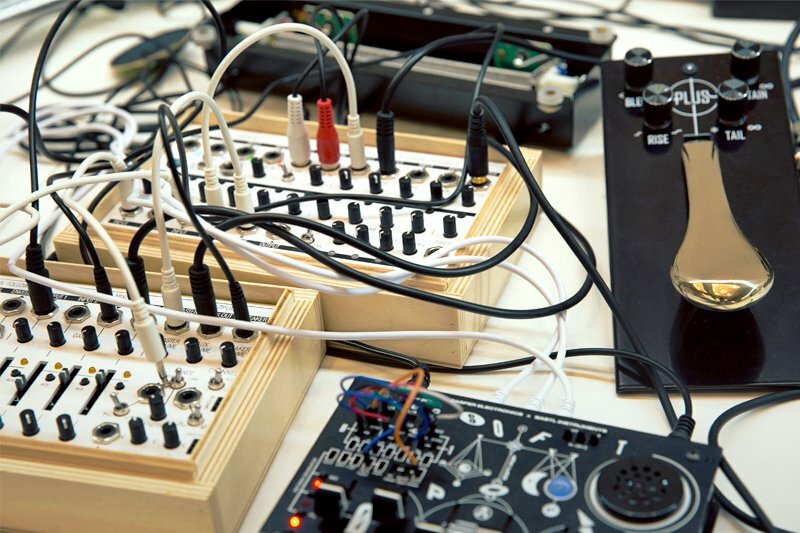 Meyer went on to test his hypothesis on his personal modular synthesizer, using a huge number of resources to manage the two-dimensional crossfading he sought—but his experiment was successful. 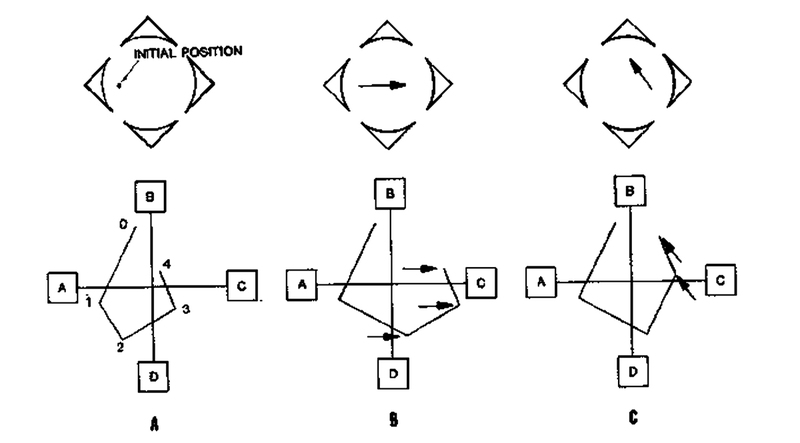 And though the name did not emerge until later, this is when Vector Synthesis was born. And while this reduction of the technique may seem straightforward, managing the continuous blending between four sound sources requires a lot of resources: in the analog world, it would require VCAs whose levels change in tandem with one another—an effect that would require tons of offsets, polarizers, and signal multiples (let alone patch cables) in order to work. The genius of the Prophet VS lies not only in its embrace of novel sound design...it also lies in its remarkable vocabulary of modulation sources, and their relationship to the core idea of two-dimensional waveshaping. The Prophet VS's voice architecture alone is worthy of awe. The VS is eight-voice polyphonic and two-part multitimbral, with a vector oscillator section, analog Curtis filter, amplifier, and even independent panning for each voice. At the end of the chain, it also offers a BBD-based stereo analog chorus, complete with chorus depth and rate controls—providing an easy way to tame the sometimes very obviously digital sounds into a softer evolving state. Interestingly, chorus can be activated and deactivated for the left and right channels independently, creating bizarre spatial effects and the possibility of independent chorusing when using split or layered sounds. The VS of course offers extensive preset memory, making it easy to create new patches and to use any preset patch as a starting point for new material. The oscillator section itself is remarkable, and the instrument's most obvious highlight. During the VS's design period, there was debate over whether the vector mixing capabilities should be applied to a single oscillator with various simultaneously accessible waveshapes, or whether it should be used to continuously mix between four distinct oscillators per voice. 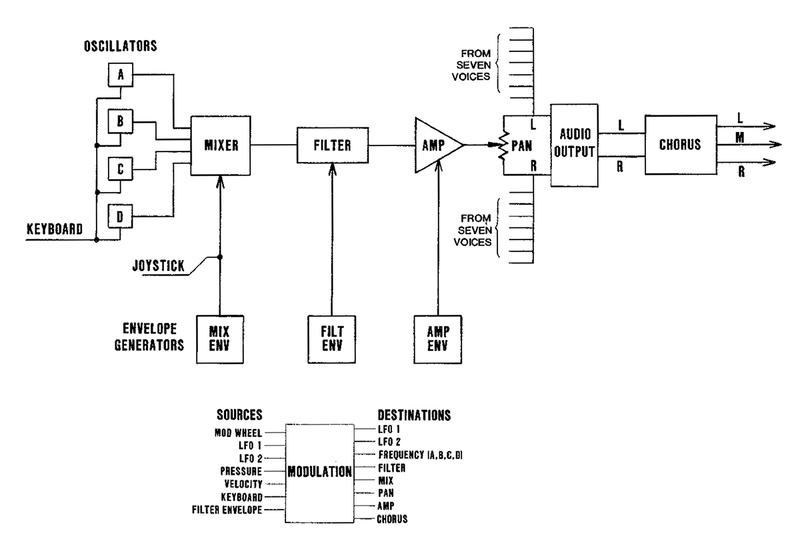 And while it seems like the single-oscillator approach may have been more practical, Sequential Circuits took the latter route, where each voice contains four relatively independent wavetable-like oscillators. 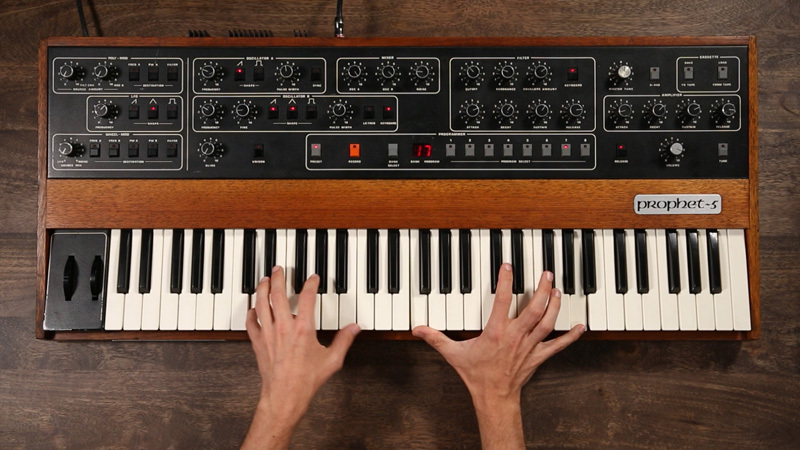 Yes—the VS contains 32 digital oscillators. Each oscillator provides a choice of 127 predefined waveshapes—and while this shape selection may not be modulated (as in traditional wavetable synths), the blend between individual oscillators may be modulated via the vector scheme. This effect is in most situations far more smooth than the types of sounds one could achieve with, for instance, a PPG Wave: in the Wave, this type of timbral complexity typically comes from modulating wavetable selection, and only some banks of waves offer subtle enough changes from shape to shape to be convincingly continuous—many banks can be quite jarring when modulating wavetable selection. The VS's vector crossfading scheme is a very Prophet-like take on the concept, offering seamless, smooth blending between sounds rather than abrupt changes. Each oscillator in the VS voice can also be tuned independently of one another, with coarse and fine frequency control permitting everything from subtle detuning and chorusing effects to creation of chords, stacked octaves, etc. With these tuning options in play, even selecting the same waveshape for each corner of the vector "diamond" can have dramatic implications: navigating to different regions of the "diamond" space can reveal dynamically shifting clusters and swarms, microtonal harmonies, additive-like tone stacking, evolving chords, and more. Moreover, each individual oscillator can be modulated separately from the others via the internal LFOs—so navigating to certain corners of the diamond can even serve to mask and unmask independent modulations. 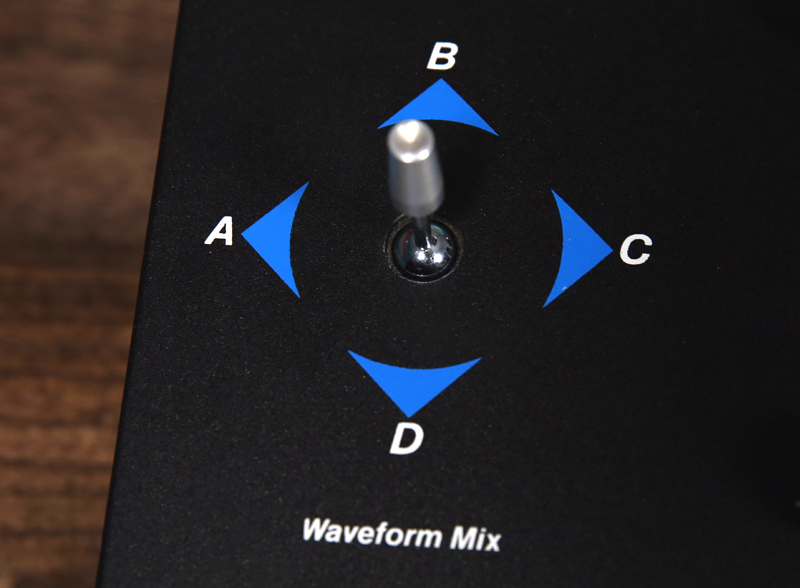 Detail of the Waveform Mix joystick. The diamond may be navigated in a multitude of ways (which we will definitely get to in a bit)—but the primary method is brilliant and iconic: the joystick. Allowing easy manual traversal and programming, the joystick is an ingenious means of providing tactile access to the abstract timbral space the VS offers. 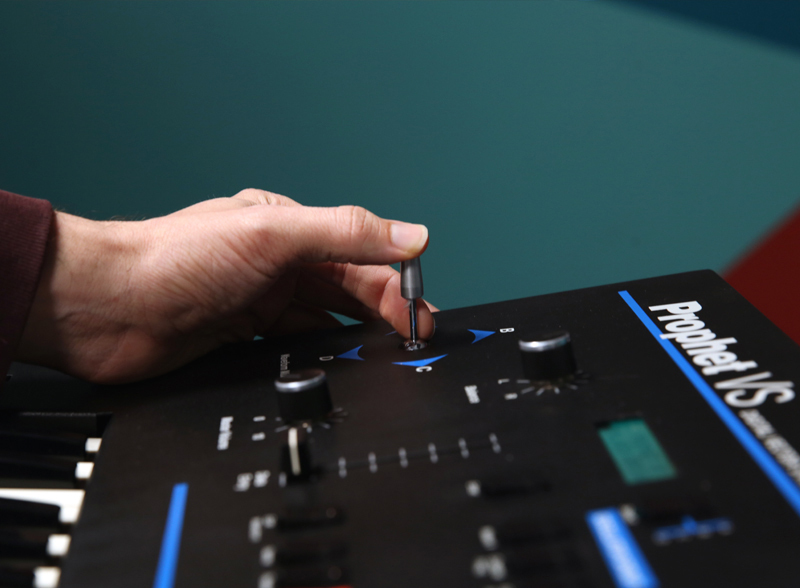 The joystick becomes a main expressive control, joining the pitch and mod wheels as primary means of interacting with the sound in real time. Of course, interacting with the joystick in most situations means compromising the ability to play polyphonic passages, so the VS of course offers countless ways of animating trajectories within the vector space. 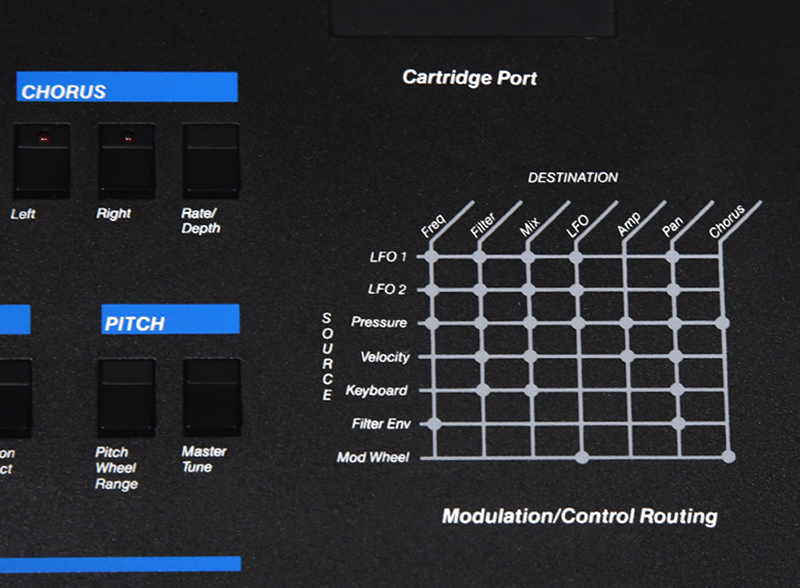 Modulation routing options as printed on the Prophet VS front panel. The Prophet VS offers matrix-style modulation assignments, selectable via the Source Select and Destination Select menu buttons. Only one modulation source may be routed to each destination, but this is seldom an issue since there is such a wealth of modulation options available. 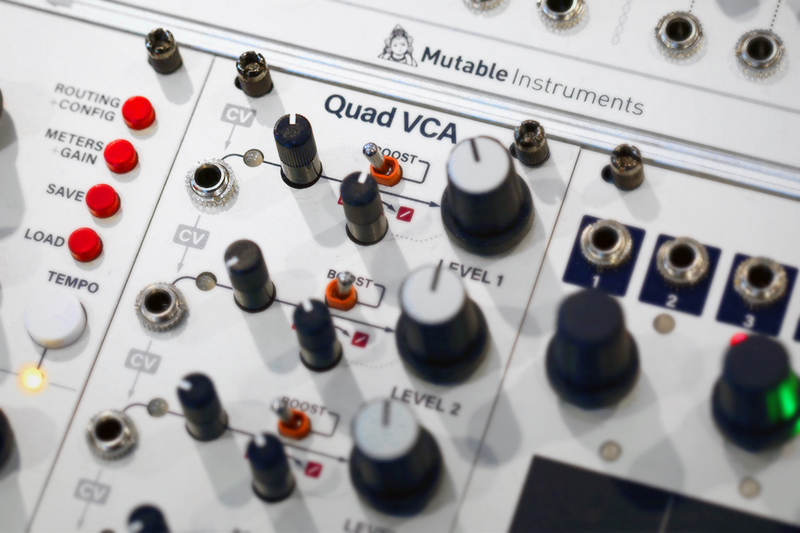 Not every parameter can be modulated by every source, but the potential routings chosen by Sequential Circuits are quite clever and cover the majority of typically viable routings. 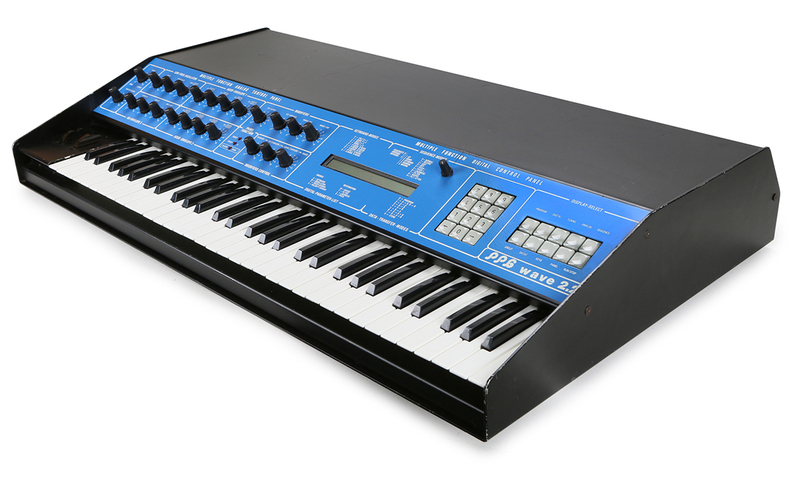 The VS has two LFOs, velocity sensitivity, optional keyboard tracking, and a large array of envelopes. The LFOs, velocity sensitivity, and keyboard tracking can all be used to modulate the oscillator vector mix by separately addressing the X-axis (A–C Mix) and Y-axis (B–D Mix), making it possible for the timbre to shift based on register, playing intensity, or by automatically drifting between shapes over time. Of course, the same types of typical synthesizer modulation can also be applied to the frequency of individual oscillators, the filter cutoff, the LFOs, panning, and more. Detail of the VS's Envelope Group controls. Perhaps the most interesting (and commonly overlooked) resource in the VS aside from the obvious joystick-driven timbre shaping is the envelope section—far more complex than the typical envelope. Chris Meyer had been using the Buchla 400 leading up to the development of the VS; according to legend, Sequential Circuits had been considering licensing some of the 400's internal technology in their instruments, namely the envelope section. As with all Buchla instruments, the 400's control options were quite complex and customizable, focused on overcoming the limitations imposed by more "mainstream" instruments. 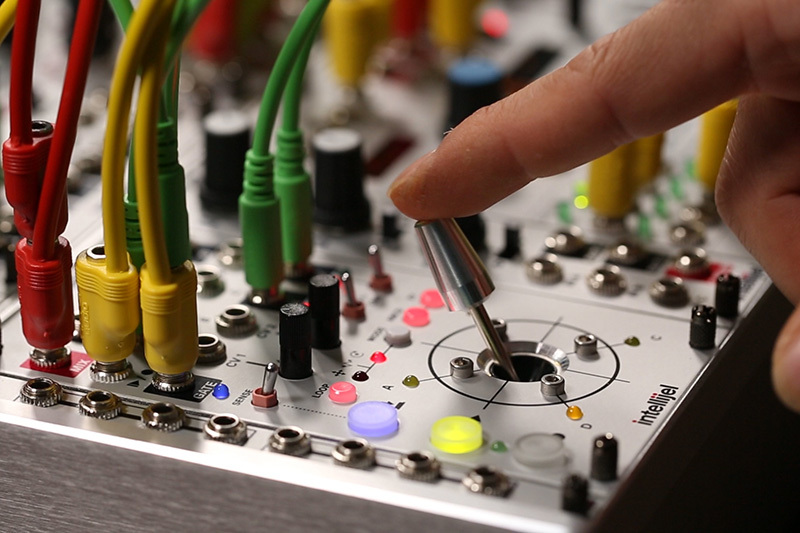 Rather than using traditional ADSR-style, one-shot linear envelopes, Buchla's hybrid and digital instruments used arbitrarily-definable multi-breakpoint functions as complex modulation sources that could address any of his instruments' internal parameters. 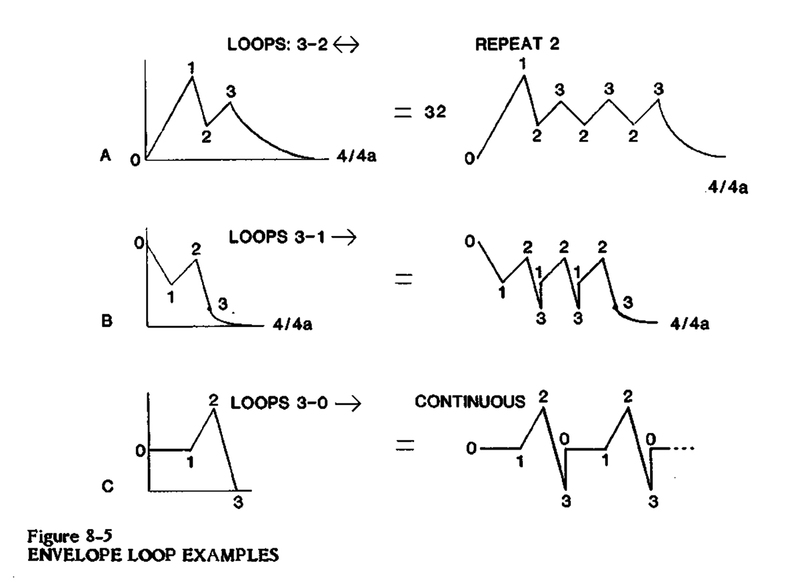 Buchla's "functions" in the 400 were ten-segment graphs that could be treated identically to typical envelopes, responding to key presses or external pulses; but they also offered extensive options for looping and realtime modification. Users could define "jumps" and "loops," by which the envelope would advance forward or backward to specified stages depending on specified conditions: for instance, an envelope could loop between points three and seven as long as a key was depressed, or could skip steps entirely if a gate was present at an external input. 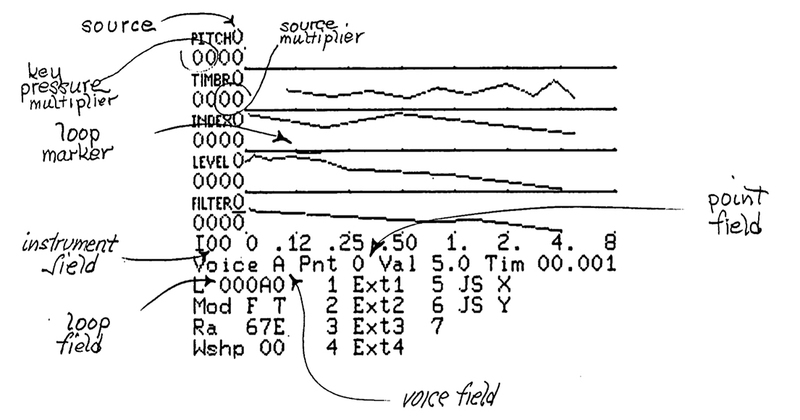 Envelope/function editing detail from the Buchla 400 MIDAS manual. 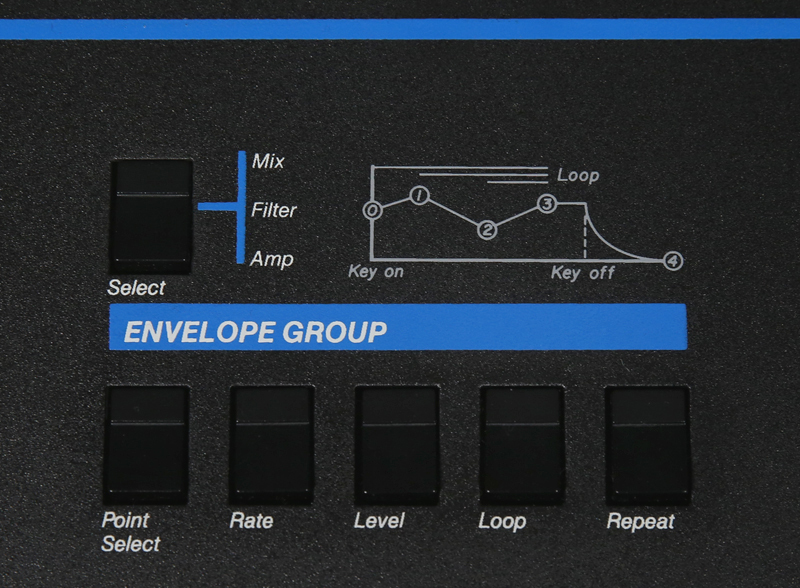 While Sequential Circuits did not ultimately license Buchla's design, it is clear that the envelopes in the VS are directly inspired by the abstract and highly flexible nature of the 400's modulation options. The VS offers three complex envelopes for each voice: one dedicated to Waveform Mix, one for the Filter, and one for the Amplifier. These envelopes, like Buchla's, dispense of traditional stage names (attack, decay, etc.) in favor of five stages separated by breakpoint numbers 0–4: 0 corresponding to the envelope position at the moment of key closure, 4 corresponding to the "zero point" after the end of a key release. But what happens between is quite unique.  Points 0–3 offer direct level controls, and points 1–4 additionally provide rate controls—that is, the rate at which the envelope progresses from the previous breakpoint to the new one. If keys are held, the envelope will hold at breakpoint 3's level, advancing to point 4 at the rate specified by "rate 4," much like the Sustain and Release stages in a typical ADSR envelope. And while traditional attack and decay-style setting can also be achieved, the conceptualization of the early stages of the envelope as individual breakpoint levels separated in time also enables the creation of much more complex shapes. Examples of different envelope looping scenarios from the Prophet VS manual. The envelopes may also exhibit an additional special behavior when keys are depressed: looping. In this way, envelopes can assume LFO-like function, albeit with considerably more interesting shapes than the typical LFO. The means of looping is quite unique as well: once the envelope reaches point 3, it can loop back to any previous point directly, or by moving back and forth between point 3 and any previous point. The envelope loop may continue indefinitely so long as a key is held, advancing through the envelope to point 4 upon key release—or alternatively, a specific number of repeats may be specified, so that a limited number of repeats occurs before advancing to the envelope's sustain stage. Wow. It feels worth reiterating that this style of envelope is available for the filter, amplifier, and waveform mix (oh, and by the way, the filter envelope is available as a modulation source in the matrix...so it could also control the oscillators, panning, you name it). The applications are numerous, enabling access to psuedo-delay effects, slowly-evolving modulations, psuedo-reverse tricks, sounds with multiple attacks, etc. By providing such fine detail about a parameter's unfolding over time, the VS offers a level of control over sound design simply not possible in less sophisticated instruments. Vector envelope trajectory examples from the Prophet VS manual. One might wonder, though...how can a single envelope address the waveform mix, since said mix is parameterized elsewhere as a two-dimensional control? (Okay, maybe you weren't wondering that, but I definitely was.) The Mix envelope quite cleverly uses the joystick as a data input method. Rather than using the data entry slider to provide level controls for each envelope breakpoint, the user can simply grab the joystick and move it to the desired position: leaving all the math and tough thinking to the machine, rather than forcing users to consider the relationship between two separate envelopes that ultimately address one parameter. This makes it possible to create complex and highly intentional trajectories through the timbre space, complete with control of timing between locations and the ability to wander back and forth along the defined trajectory. Calling the VS's arpeggiator an arpeggiator feels a bit reductive. Especially given the VS's potential for splitting and layering multiple timbres simultaneously, the arpeggiator provides a host of intense options for animating sound, and perhaps is better thought of as a complex sequencer capable of creating unexpected polyphonic and polyrhythmic results. With simple settings, the arpeggiator functions like one may expect: it arpeggiates notes held on the keyboard over a specified number of octaves in the order specified by the "scan" setting, and can optionally be latched to keep one's hands free to tweak other aspects of the sound. Additionally, it features an auto-latch mode where notes are arpeggiated until all notes are released and replaced by a new set of notes, making it easy to arpeggiate a chord and quickly switch to a new arpeggiated chord. The last arpeggiator mode, Extend, is perhaps the most interesting—it enters notes into a pseudo-sequence, allowing sequences of up to 120 notes to be executed in order. Players may continuously add more notes as the arpeggiation plays out, creating sequences that become increasingly complex as they play. 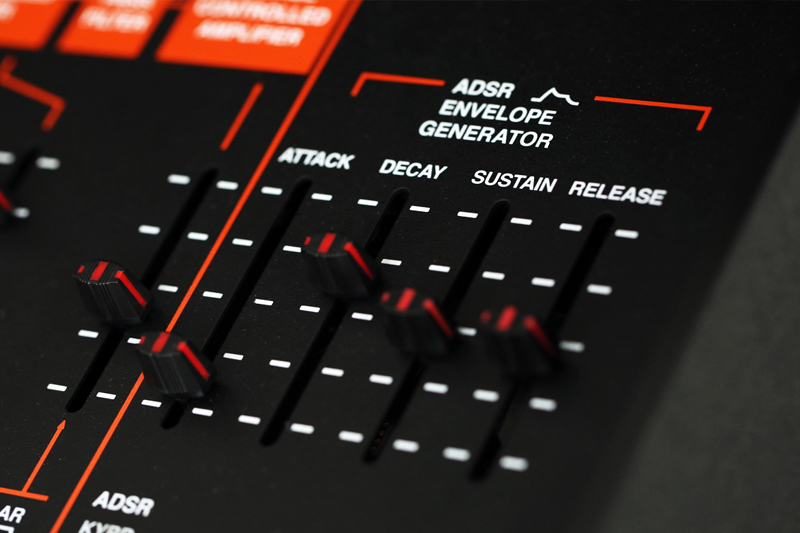 The arpeggiator offers all of the typical "scanning" modes—up, down, up/down, and random—but it also provides two uncommon scanning modes: "assign" and "reverse." In the assign scanning mode, notes are arpeggiated in the order that they were played; in the reverse mode, they are arpeggiated in reverse order. Furthermore, each note within an arpeggio can be repeated up to four times before progressing to the next note, making it easy to generate complex relationships between pitch and rhythm from even the simplest starting points. Velocity may also be recorded as part of an arpeggiation, providing dynamic contrasts within the stream of cascading notes. 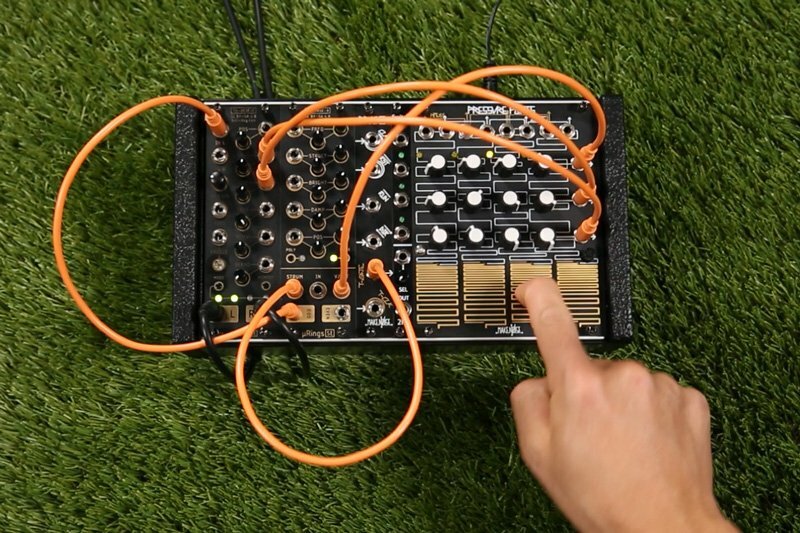 Even with just this peculiar combination of features, the VS's arpeggiator is a singular tool; but two more options take it truly out of the realm typically occupied by arpeggiators and into territory typically relegated to sequencers. Unlike many arpeggiators, the VS provides the option to insert rests into arpeggiations to create syncopation and complex rhythmic phenomena. Combined with the Extend mode option, this turns the VS's sequencer into something akin to an SH-101's sequencer—but with a memory of up to 120 notes. Arpeggio sequences may independently impact split voices, and may themselves be layered: that's right, a second arpeggio sequence can be overdubbed on top of a latched sequence. Moreover, there is no need for the two arpeggio layers to be the same length...they can play out indefinitely at different lengths. Combined with the ability to insert rests into an arpeggio sequence and the ability to affect two different timbres simultaneously, this makes the VS arpeggiator into something far more peculiar: a polyrhythmic, polytimbral sequencer with a huge note memory and the ability to rearrange the order of notes on the fly. My favorite (and probably strangest) aspect of the Prophet VS is something of a hidden feature: the Patch Randomizer. Apparently borne from experiences with a temperamental prototype VS which at some point randomly overwrote its own patch memory, the patch randomizer does exactly as its name implies: it randomizes all parameters within the voice structure in order to create programs that a user more often than not would not think to create. The end results are more often than not quite peculiar, and demonstrate the VS's potential to breach past the world of fizzy evolving pads into heavily modulated outright digital mayhem. The VS manual states that this is "an effective way to overcome 'programmer's block,'" and that "if the random program shows little promise, generate other random programs until a better one appears." The patch randomizer even randomizes the patch name—as evidenced by program "I4GQKYVV." In my experience, almost every randomization does something interesting—everything from sci-fi computer sounds to seasick, drifting pads and patches that seem to respond remarkably organically to a player's interaction...almost like a peculiar animal reacting unpredictably to various key presses, wheel turns, and joystick repositions. One of the coolest side effects of the way this feature is implemented is that arpeggio sequences may be latched in such a way that they continue across randomizations: since randomizations are treated like edits to the current program, it is possible to randomize repeatedly while the arpeggio is running, making it possible to generate flurries of unpredictable sound without even needing to touch the keys. Even if the countless other features don't make it obvious that the VS is very much unlike the other Prophet family synthesizers, the patch randomize function will definitely make it clear where its strong suits lie, and where it differs from basically every other synth out there. As should now be obvious, vector synthesis was originally an alternative to traditional wavetable techniques, designed to make it possible for a single synthesizer to produce everything from the sound of a Prophet-5 to the sound of a PPG Wave. The VS's implementation is remarkably well-thought-out, providing not only an intense array of sonic options, but a gamut of unique modulation sources implemented in a way that feels like an entirely natural complement to the synthesis method itself. 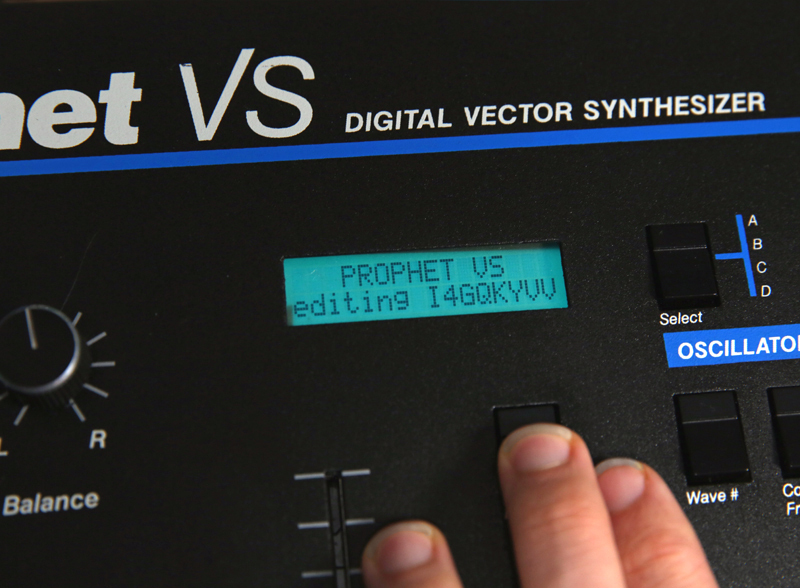 The vector synthesis technique originated in the Prophet VS, but has had an extensive life afterward as well. Once Sequential Circuits closed its doors, Dave Smith went on to help develop Korg's Wavestation—and countless other devices since have employed the technique, such as Yamaha's SY-22 and TG-33, Korg's OASYS, Arturia's Origin, and more. 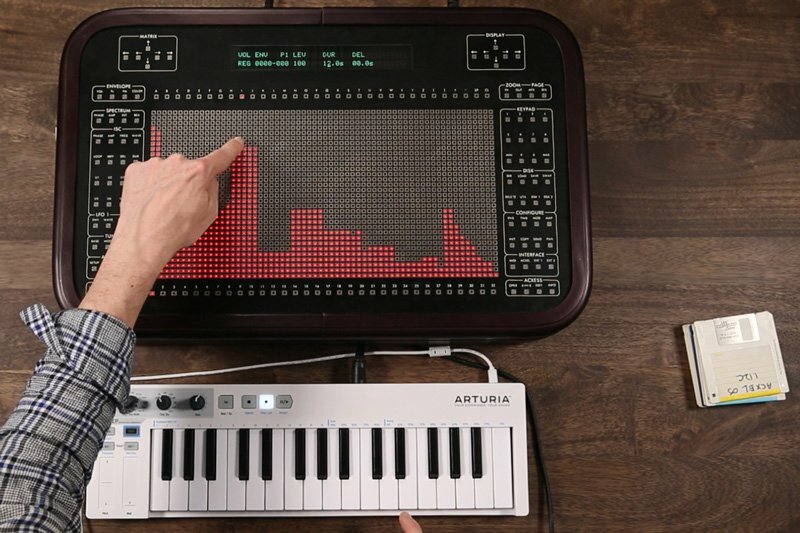 This functionality in these synthesizers feels like an obvious throwback to the VS itself, though, with little done in any case to advance the technique or provide much deeper control. Perhaps it was complete enough in its initial form. Vector mixing techniques have likewise made their way into the modular synthesis world, and have here been afforded more flexible and interesting implementations. 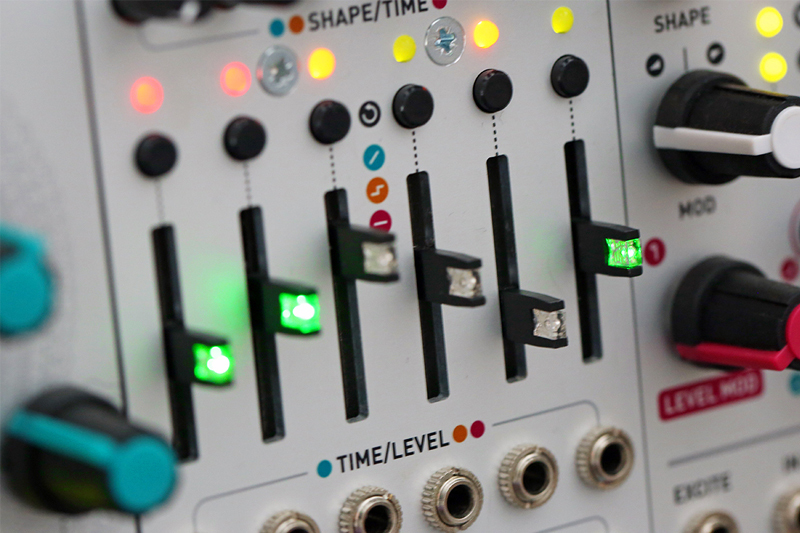 Intellijel's Planar and Planar 2 modules, for instance, can act either as quadraphonic panners or four-corner vector mixers, complete with joysticks and CV-addressable control. While these modules aren't afforded the same complex envelopes as in the VS, the Planar 2 does offer options for joystick motion recording, as well as CV-addressable control of playback position—approaching the "trajectory" idea from a different angle, this could provide all of the options presented by the VS's Mix envelope and more, with the option to combine any sound sources one might desire. Vector mixing is also made possible in Antimatter's recent release, the V3KT—and direct access to a spot-on VS emulation can be found in Arturia's Prophet V plugin collection. Not always can an entire synthesis method be traced back to a single instrument. And while wavetable techniques were definitely around before the VS's inception, there is something distinct and special about Vector Synthesis...a special way of parameterizing timbre as a two-dimensional space, musical direction as a physical trajectory, and sonic evolution as an aimless, playful wandering.